A NEW family-run restaurant in Knaphill threw a fine Italian feast to celebrate opening their doors. Former professional golfer and commentator Peter Alliss, along with the Mayor and Mayoress of Woking Tony and Mary Branagan, shared food, drink and laughter with the many other visitors to La Bella Amalfi in the High Street. But there was a more tender side to the family-run occasion. While friends and guests tucked into the delicious culinary delights of the plentiful spread laid on by the venue owners, brothers Salvatori and Nino Lanzetta, they were invited to make a donation to the Cystic Fibrosis Trust. Nino’s daughter Veronica, who is 28, was born with the debilitating genetic disease. She was diagnosed at eight months and has been blighted by hospital visits all her life. Both parents have to be carriers of the gene. Veronica’s sister Sofia, who’s 32, and 27-year-old brother Alfonso are also both carriers but neither have cystic fibrosis. It is a cruelly progressive condition in which excessive production of mucous clogs the lungs and pancreas, causing respiratory and digestive problems. Children are usually diagnosed in the first few years of life, and less than half live beyond the age of 18. For those who do, life expectancy is about 35 years. However, this figure could improve with more advanced treatment options, which is why it is so important to raise funds for more research. Veronica’s lungs are now so damaged from degeneration that everyday activities are extremely difficult, if not impossible. She is on antibiotics, inhalers and has to take enzymes with food. She is also on oxygen 24/7, is virtually housebound in a wheelchair and is dependent on her primary carer, mum Antonietta. Veronica, who has lived in Woking all her life and went to St John the Baptist School, has a feeding tube or ‘peg’ attached to a hole in her stomach to supplement her diet. Although she is able to eat a normal meal, she has to intake 3,000 calories a day, which in turn leads to further vulnerabilities and complications. Her second tube was fitted six months ago after she was rushed to London’s Westminster Hospital with peritonitis caused by the first. 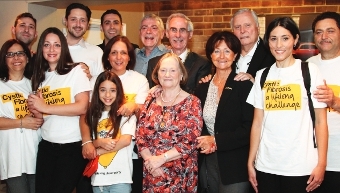 La Bella Amalfi, at 42-44 High Street, raised £375 towards the worthwhile cause. VISIT ww.cysticfibrosis.org.uk to make a donation or to get involved with the Cystic Fibrosis Trust.